Michele M. Tugade, PhD, is Professor in the Department of Psychological Science at Vassar College, where she directs the Emotions and Psychophysiology Laboratory. Her research focuses on the function of positive emotions in the coping process; the mechanisms that promote resilience in the face of stress and adversity; and emotion-related processes associated with health and well-being. Her program of research incorporates multiple research methodologies, including laboratory-based experiments, experience-sampling methodology, behavioral analyses, and psychophysiological measurement procedures. Dr. Tugade received a Ruth L. Kirschstein National Research Service Award from the National Institute of Mental Health and is an elected member of the International Society for Research on Emotions. Her most recent book is The Handbook of Positive Emotions (Guilford Press). Tugade, M. M., Shiota, M. L., & Kirby, L. D. (2014). Handbook of Positive Emotions. New York, NY: Guilford Press. Baird, A. A., Tugade, M. M., & Veague, H. B. (2008). Association for Psychological Science. Current Directions in Introductory Psychology. New York, NY: Pearson. Tugade, M. M., Devlin, H. C., Fredrickson, B. L. (2016). Positive Emotions. In S. Lopez, L. Edwards, & S. Marquez (Eds.) Oxford Handbook of Positive Psychology. New York, NY: Oxford University Press. Kirby, L. D., Tugade, M. M., Morrow, J., Ahrens, A., & Smith, C. A. (2014). Vive la differénce: The ability to differentiate positive emotional experience and well-being. In M. M. Tugade, M. N. Shiota, & L. D. Kirby (Eds.) Handbook of Positive Emotions. New York, NY: Guilford Press. Kirby, L. D., Tugade, M. M., & Shiota, M. N. (2014). The science of positive emotion: Synthesis, commentary, and future directions. In M. M. Tugade, M. N. Shiota, & L. D. Kirby (Eds.) Handbook of Positive Emotions. New York, NY: Guilford Press. Mitamura, C., Leu, J., Campos, B., & Tugade, M. M. (2014). Traversing affective boundaries: Examining cultural norms for positive emotions. In M. M. Tugade, M. N. Shiota, & L. D. Kirby (Eds.) Handbook of Positive Emotions. New York, NY: Guilford Press. Tugade, M. M., Devlin, H. C., & Fredrickson, B. L. (2014). Infusing positive emotions into life: The broaden-and- build theory and a dual-process model of resilience. In M. M. Tugade, M. N. Shiota, & L. D. Kirby (Eds.) Handbook of Positive Emotions. New York, NY: Guilford Press. Tugade, M. M., Shiota, M. N., & Kirby, L. D. (2014). The science of positive emotion: An overview. In M. M. Tugade, M. N. Shiota, & L. D. Kirby (Eds.) Handbook of Positive Emotions. New York, NY: Guilford Press. Tugade, M. M. (2009). Barbara Fredrickson (Biographical entry). In S. J. Lopez (Ed.) Encyclopedia of Positive Psychology. London: Blackwell Publishing. Stress is part of everyone’s life, but there are ways to bounce back from adversity. 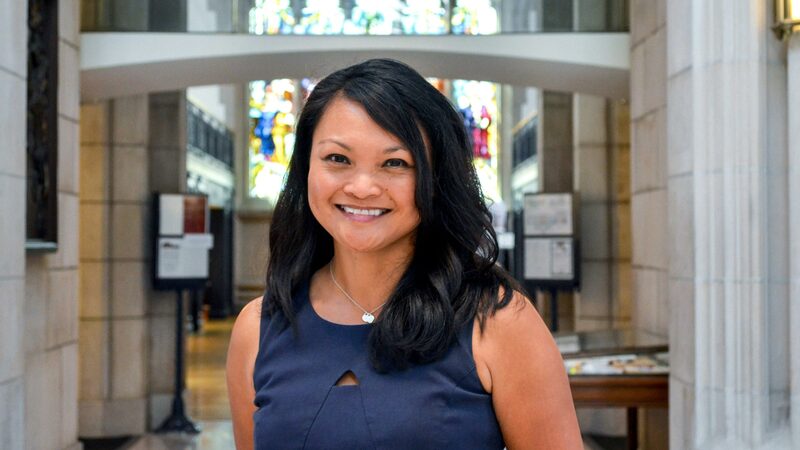 Prof. of Psychological Science Michele Tugade ’95 has devoted her research to helping students—and even some astronauts—learn how to be resilient.